For my money, there's nothing better than a great RPG. The best of the genre offer vast worlds, rich with intriguing lore, satisfying and strategic combat, and the chance to be anyone or anything you want. But they can also be a frustrating slog - and not always because you need to grind up a few levels before you face the secret Crimson Omega boss. Sometimes, an RPG just takes too long to tell its story. Maybe you just don't have time to listen to the all-knowing prophet explain how you are the chosen one sent by destiny to save the land. Or maybe you just don't care to sit through a 15-minute dialogue exchange, or read a small novel's worth of text. Sometimes, you just want to get back to slaying monsters, dang it. But still, that's just how RPGs are, right? It's an unspoken rule: RPG heroes steal from people's homes, townsfolk can't so much as pick five flowers without asking an adventurer to do it for them, and all dialogue must be in the form of overwritten exposition. At least that's what I thought, until Nintendo's latest mobile game, Dragalia Lost, let me skip all that nonsense with one simple-yet-ingenious feature. Dragalia Lost (developed in conjunction with Cygames) is a pretty by-the-numbers JRPG. You've got a spiky-haired blond prince chosen by destiny, a kingdom under siege, and a supporting cast that feels primed and ready for reams of fan art. As a mobile game, it's also fairly simple. You touch and hold the screen to move (like pushing a digital thumbstick) and tap to attack, with a small assortment of special abilities also available at the touch of a button. The Witcher 3 this clearly is not. 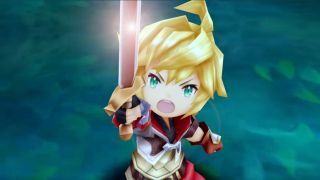 However, when it comes to telling its story, Dragalia Lost feels leagues ahead of most RPGs. Whenever a cutscene or dialogue between characters occurs, you can press a skip button that will fast forward and get you back in the fray pronto. But it's not what Dragalia Lost's skip button does (after all, plenty of RPGs and other games let you skip text or cutscenes). It's how it does it. Once you press the skip button, you'll be given a small text block that explains what went down in the conversation or scene you just skipped. Early on, for example, you're joined by your sister Zethia and your fairy friend, Notte. If you press the skip button during this event and its ensuing dialogue, you're greeted with the following, easy-to-parse message: "The princess Zethia and the faerie Notte join forces with the prince. With hope renewed, the three push deeper into the forest." I understand being a little underwhelmed by those two sentences - but when I first saw them, I audibly gasped at the brilliance of such a seemingly simple idea. If I skip all the dialogue and cutscenes, I can still have a sense of what just happened and why it was relevant to the story. If I change my mind and decide that I want to see what happens after all, I can just hit "cancel," and Dragalia Lost will take me back to where I was and resume the content I had just skipped. I've played RPGs or other story-intensive games where a loading screen might offer a recap of important events (Final Fantasy games recently started doing this), but never have I seen a game offer me CliffsNotes for the cutscene or dialogue I just skipped. And if you don't want to use the feature, it doesn't get in the way. Those who do want to enjoy the story in full can do so. It's really a win-win feature. Oh, and in case you skipped all of that text to get here, here's my two-sentence summary: Dragalia Lost's skip feature lets players enjoy the game's story at their own pace. Here's hoping that those big-budget games take notice and ape this small but oh-so-helpful tool.